So far, this month has been the anti-goals month. Or rather, it’s been a more spontaneous month. I did spend an hour drawing this week. The drawing turned out … okay, but I enjoyed myself. Did I hit my goal of three to four sketches? No, I did not. 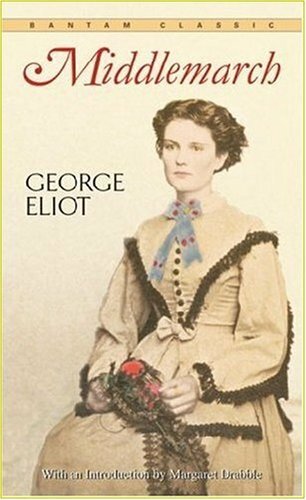 But I did start reading Middlemarch by George Eliot, a sweeping, substantial Victorian novel often praised as one of the great masterpieces of English fiction. I spontaneously decided to undertake this epic reading project thanks to The Toast, which is hosting a virtual Middlemarch book club. And, you guys, I am SO excited to read this book and talk about it online because I never did finish it during my undergrad Brit Lit survey (the shame). So, I forgive myself for reading this book instead of sketching more. Just like how I forgive myself for not writing in my journal some mornings because staying in bed and cuddling with my husband for those precious 20 minutes before we absolutely have to get up seems worth it. I’m still learning to balance things. And I’m also learning not to fight my natural whims. I set a good goal, but it wasn’t “filling the well” the way I thought it would, and so I’ve let myself take down time and start other projects. And it’s okay, because this month I really do feel grateful to have time to relax before the holiday whirlwind, to have time to tackle this book, and to have time to spend baking and chatting with my new friend. I need these antidotes to work stress and the last few (completely insane) weeks of my husband’s graduate program. So, I suppose I’ll try to make time to draw again this week — but maybe I’ll just read instead. Today I’m grateful for: this amazing marbled pumpkin gingersnap tart recipe from my Smitten Kitchen cookbook. I know what I’m making for Thanksgiving.